Single serve pod type coffee machines are really growing in popularity. They produce coffee that’s so much better than your standard cup of instant coffee, but without the hassle of a barista style coffee machine. It’s no wonder so many people are choosing them! We have tried and tested several single use pod coffee machines to find the best of the bunch and save you from spending your hard earned dollars on a machine that isn’t all it’s cracked up to be. We have chosen the Bunn MCU as our second place coffee machine, coming in second only to the Keurig K55. 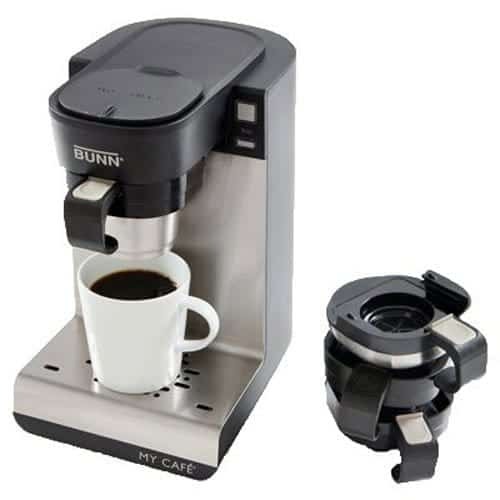 The main reason the Bunn MCU wasn’t our top pick is because it’s a little bit more expensive than the Keurig K55, but at the same time, it does have a few more features too. How Well Does This Machine Work? Who is The Bunn MCU for? Who isn’t The Bunn MCU for? The ability to brew coffee and tea from pods, use ground coffee, tea bags or loose tea. The machine includes four interchangeable drawers which allow you to select the type of drink you would like to make. Has a feature to run through hot water if you like a longer coffee. Has a Pulse Brew option which gives your coffee a stronger, richer flavour. Brews your drink in under a minute. The removable drip tray allows for easier cleaning, and also means you can place a larger cup, e.g. a travel mug, under the pour spout. Has options for 40z through to 140z servings. The machine works really well when using the pods. The interchangeable draws are a bit tricky to slot in and out at first, but once you get used to them, they are pretty easy to change allowing you to flick between types of drinks. Try pulling up on the handles slightly as you pull them out to make this process a little easier. The coffee comes out at a good temperature and doesn’t come out cool and go cold quickly like some machine made coffee. This is especially true when using the pod drawer as the brew is pretty much instant. When using your own ground beans, use a finer ground to ensure the temperature remains hot. If you use a coarser grain, the water will take longer to filter through the grains meaning that it obviously won’t be as hot, and after adding milk or cream, you will notice a difference in the temperature of your drink. This machine, unlike some of the other popular machines, requires a constant water level of 14oz. This amount of water is left in the tank, and for each cup you make, you must add the amount of water desired for that cup full. Although the manufacturer states this machine is only compatible with K-cup pods, actually most pods will fit this machine, so you don’t have to spend a fortune on over priced pods. However, if you use non-recommended pods and there is a problem with the machine, you won’t be covered by your warranty. The Bunn MCU is perfect for anyone who wants to have the option for freshly ground coffee, but also wants the option of using a quick and easy pod coffee from time to time without having to have two machines. This machine isn’t for anyone who primarily drinks tea as the tea just isn’t that great. Overall, although there were a few sticking points that let the Bunn MCU down, we still really liked it. Is it worth the extra $80 over the Keurig K5﻿﻿5? No, but it does come a very well deserved best of the rest. As our runner up, you are guaranteed a great tasting coffee and a durable machine that works well. As our runner-up, you are guaranteed a great tasting coffee and a durable machine that works well.